13-15 - Tues-Thurs ~ Dr. Rajesh Kotecha Private Ayurvedic Healing Consults $95 - Call OM for Appt. 15-19 - Thurs - Mon~Dr. David Bole Private Toyahari Acupuncture Sessions $65 - Call OM for Appt. Ayurveda means "the knowledge or science of life." Learn how Ayurveda can restore the body to wellness! Experience pulse, eye, tongue evaluation, body typing, and more. Each individual is genetically different, giving each a specific constitution (Prakriti) and an individualized treatment plan. Dr. Rajesh Kotecha holds an M.D. in Ayurveda. He is chief physician and executive director of Chakrapani Ayurveda Clinic & Research Center in Jaipur, India. Dr. Rajesh visits the US twice a year to work in Nevada and Nebraska. 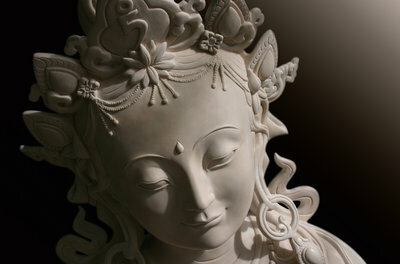 Featuring Tibetan Butter Sculptures by special OM guest artists the Gaden Shartse Monks! Sept. 14-16: The Tibetan Gaden Shartse Monks are BACK!!! Private healings & blessings (home/business) available; call OM for appts. Butter sculpture is an ancient Tibetan Buddhist art. Although it is not as well known as another Tibetan ritual art, the sand mandala, it is still an important aspect of Tibetan Buddhism in its own right. Butter sculptures symbolize impermanence (a main tenet of Buddhism), along with more ritualistic components, and are usually destroyed in anywhere from a day to a few years. They are traditionally made with yak butter, but in exiled Tibetan communities, as the weather is usually warmer, it is made with ghee, fat, and wax. Butter sculptures are displayed on altars and shrines in monasteries or family homes. They are traditionally made every Losar (the Tibetan New Year), and for the Butter Sculpture Festival, part of the Great Prayer Festival, or "Monlam Chenmo," that is held soon after Losar. During this time, monks make story-high butter sculptures displayed outside the Jokhang in Lhasa, the holiest temple in Tibetan Buddhism. Tea Ceremony/ Tsok Offering (meditation & chanting) • 8pm • $15 adv * $25 day of * $7 w/ student ID Join the monks for traditional offerings filled with peace and gratitude, enhanced with beautiful multi-tonal chanting. Sept. 15 - Tara Puja • 7pm • $20 adv * 25 day of * $7 w/ student ID Through this ceremony with Tara, the Mother of the Conquerors and a manifestation of the ultimate wisdom of all the Buddhas, we can purify negativity, accumulate merit, and receive blessings. Cooking with the Monks at 5pm • Dinner 7-8pm • $45 advance payment required ~MUST RSVP! Momo-making demo and dinner with the monks! 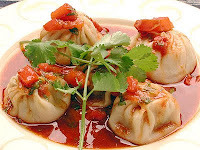 Meet the monks, enjoy delicious Tibetan dumplings with side dishes, learn how to make momo (traditional Tibetan dumplings), with Q&A from the monks. 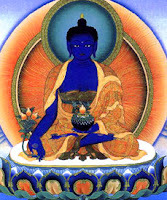 Medicine Buddha is believed to have the power to free one from the pattern of negative thoughts and emotions, as well as healing body. mind, and spirit. During this detailed meditation, participants will be given the Medicine Buddha mantra (words of spiritual transformation) from a direct, ancient unbroken lineage. Especially beneficial to those in healing professions, the empowerment is open to all. Presented in conjunction with Asian World Center and Creighton University. The powerful Chay Drol ritual helps remove the obstacles that prevent one from achieving wisdom and enlightenment. The Lama places colored strings and pieces of cloth (our obstacles) on participants. The obstacles are cut using Weapons of Wisdom, opening the door to liberation and to attaining your goals. Presented in conjunction with Asian World Center and Creighton University. Sept. 15-19: Private Toyohari Acupuncture Session with Lama Dr. David Bole Call OM to schedule your appointment! Learn how to bring a greater and deeper understanding of the interaction and connection of your mind and body to achieve spiritual enlightenment and well-being. When we understand our energy fields, we can change the things that are making us feel stuck, sick, or out of balance. Removing these blockages will allow the body, mind, and spirit to return to homeostasis. 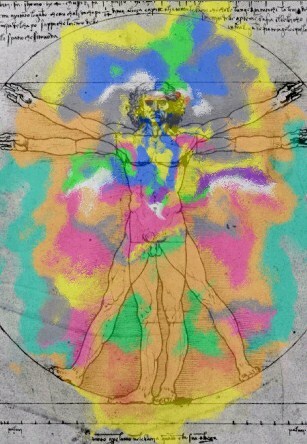 Through advancements in bioenergetics and biofield technology, we are now able to see the full body electromagnetic field as well as the energy of nearly 50 different organs and glands. Through this state-of-the-art energy technology, you can see your aura and validate psychological and physical conditions. This form of aura technology is currently used throughout the world by conventional and complementary practitioners to see and analyze the mind-body-spirit connection. To book a full hour reading (which includes an aura and chakra analysis plus picture and recommendations) please call Chanell directly at 402-689-0905. Schedule your sample reading by phoning OM at 402-345-5078. Acupoint Pressure Therapy (APT) is a complete system of healing and a type of massage therapy used in traditional Chinese medicine. 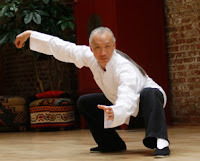 Dr. Bole will teach a range of techniques, from those thousands of years old to those informed by current research. These 25 specific acupoints are used to restore balance in body function, dispel fatigue, relieve pain, improve circulation, and promote the body’s natural healing energy. By properly activating these points, we gain greater physical, mental, emotional, and spiritual well-being. This class is open to laypersons as well as professionals! A how-to, teaching on Tibetan meditation techniques; how to rest and stabilize the mind, necessary for insight meditation. 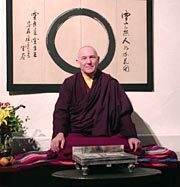 This is a method for directly seeing the mind’s true nature. Buddha would often compare himself to a physician and the teachings to medicine. Martin Klabunde & Wing Man Rita Law are acclaimed musicians. They play original music on indigenous instruments from Uganda, Guinea, and Mali, such as the Adungus (Ugandan harps), the Akogos, (Ugandan Kalimbas), the Djembes (Guinea drums), the Dununs (Mali drums), Tibetan bowls and percussion, the Native American flute, and the Australian didgeridoo. Showcasing inspirational lyrics and uplifting music, their performances are both meditative and upbeat, weaving together music, storytelling, and spiritual messages in a memorable and inspiring experience for the listener. Collective Awakening reaches deep into the sacred and takes the listener on an inner journey to the divine. 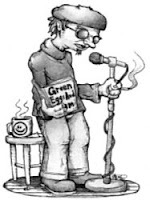 Martin Klabunde is an author, musician and a Nahual initiated in the Zapotec tradition. His mission is to provide a path of awakening through music. With more than 20 years of teaching, performance, and workshop facilitation experience, Martin has helped people from all walks of life achieve inner peace and heightened awareness through an intentional use of music. Endowed with a unique connection with drumming since childhood, Martin achieved professional skills in both Western and African drumming. Between 1991 and 2005, Martin immersed himself in the indigenous cultures of East and West Africa, studying drumming with initiated drum masters. In 2005, Martin was certified as Professor of the Djembe at Mamady Keita’s Tam Tam Mandengue International School of the Djembe. 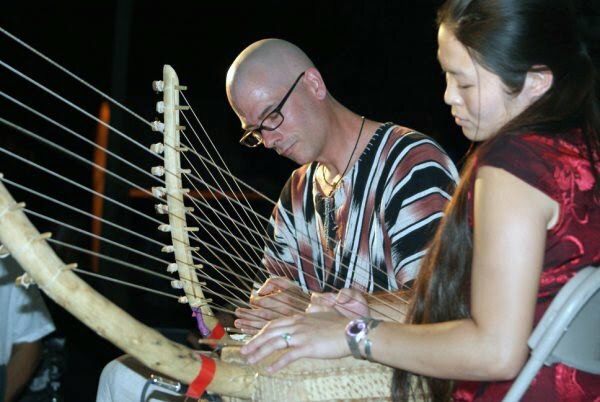 In 2006, Martin began playing other indigenous instruments such as the Adungu (Ugandan bowl harp) and the Akogo (Ugandan thumb piano). As the director of The Dambe Project, a non-profit organization that utilizes West African performance art in youth mentorship, Martin has taught music in more than 75 schools and facilitated drum circles and interactive presentations for audiences of 10 to 800 people, with a diversity of backgrounds. Wing Man Rita Law, a native of Hong Kong, came to the United States in 2005 to pursue a doctoral degree in psychology. She conducted her dissertation on the effects of Loving Kindness Meditation in alleviating social stress and received her degree from The University of Arizona in May 2011. During her stay, Wing Man discovered the power of music and meditation to transform and heal our emotional, mental, and spiritual bodies. In 2008, she began playing the Adungu (bow harp from Uganda), the Akogo (thumb piano from Uganda) and the djembe (drum from Guinea and Mali, West Africa). Through the experience of learning and playing these instruments, Wing Man developed the ability to experience greater awareness, expand her perceptions, and create a deep transformation within. She brings her knowledge of both the Western model of psychology and her personal journey of transformation to her workshops, presentations, and performances. 4pm • $FREE • Please RSVP! Join yoga instructor Susi Amendola for a guided meditation and discussion on the Omaha Yoga & Bodywork Center's Yoga Teacher Training, beginning October 2011! Become a yoga teacher! Transform your own life while serving others. Expand your knowledge, practice and understanding of the yoga tradition through the OYBC's Yoga Teacher Training program! Meet Susi at the OM Center for information on yoga and an overview of this program. Susi Amendola (ERYT 500) brings more than 30 years of experience to her teaching. She is the National Director of Stress Management for the prestigious Dean Ornish Program for Reversing Heart Disease, using yoga and meditation in hospital sites around the country. She is a certified yoga instructor through the Himalayan Institute and holds an ERYT 500 with Yoga Alliance. She founded the Omaha Yoga & Bodywork Center in 1983, where she currently serves as director. Susi has also developed a 350-hour teacher training (200-hour Yoga Alliance registered) program as a way to support teachers and students in furthering their experiences in yoga. She has traveled and lectured extensively in both the US and India, and she continues to teach, study, practice, lecture, and travel. Susi's CD, Embrace The Heart of Yoga, can be found on iTunes and in the DoYogaNow.com shop. 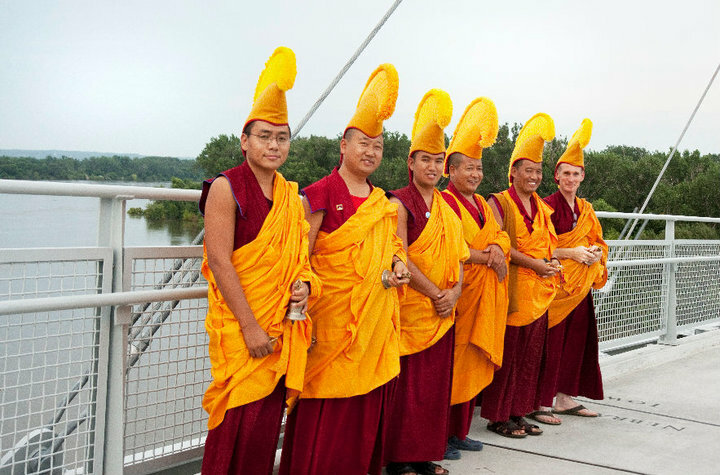 Sept. 27-29: The Tibetan Gaden Shartse Monks are BACK! Features live streaming coverage of Mandala all week, with interviews and narration about the Sand Mandala. Observe the team of monks as they use ancient ritual to create a sacred sand painting dedicated to Green Tara, Buddha of Wisdom. Viewing the Mandala opens the mind and awakens the spirit. 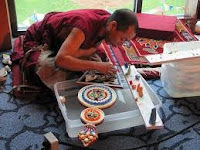 It is said that the blessings a Sand Mandala brings are multiplied by the number of grains of sand that it contains. Stop in daily to view the progress of this intricate painting, 10AM-4:30PM. These ancient and sacred dances, chants and debates celebrate Tibetan mythology, the spiritual history of Tibet and its guiding principles. All are presented with vibrant costumes, sculptural masks, evocative instruments and permeating multiphonic vocalizations. This captivating multiple-award-winning film, narrated by Harrison Ford, gives a glimpse into the life of the Dalai Lama, who invited 40 of the West’s leading, most innovative thinkers to his residence in Northern India to discuss the world’s problems and how we can solve them. What transpired was both powerful and unexpected. An interfaith discussion about the happiness of humans from the viewpoints of Catholic theologians, Tibetan Buddhists, philosophers and other spiritual traditions. 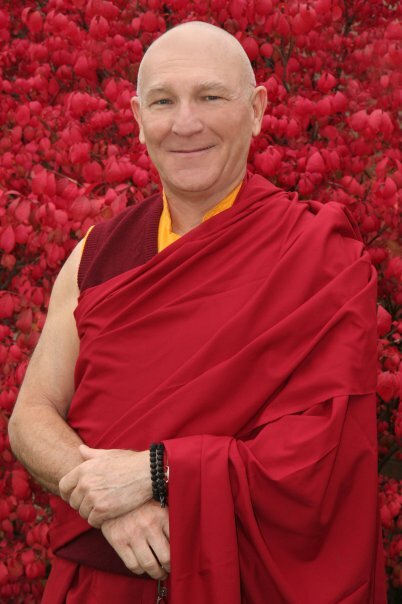 Taught by the Venerable Jangchub Chophel, this meditation opens the heart, mind and breath in compassionate practice. The meditative Sand Mandala ritual practice culminates with a closing ceremony and the destruction of the exquisite Sand Mandala, signifying the transience of life. 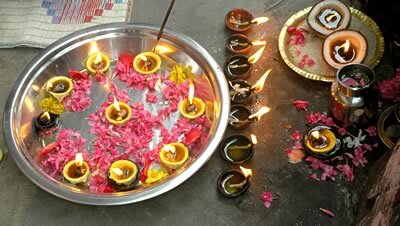 Be a part of this traditional ceremony of compassion and blessings. Participants receive a small piece of the Mandala! TAX-DEDUCTIBLE DONATIONS ARE ACCEPTED AT EACH EVENT.